Feb. 25, 2014, 6:57 a.m. The 'funny' thing being that (modern) 28" rims are the same size as 29" rims. And both are smaller than 27". Feb. 25, 2014, 8:33 a.m. I'm surprised the UCI, with all the rules they have imposed over the years in road and track, haven't bothered to enter the wheel size debate in mountain biking. Spinachi bars, rider position, wheel size (banning 650c front, 700 rear, and 700c front 28" rear in TT) etc etc, ban ban ban. You think with their excuse of even playing field, excessive costs for development for poor countries blah blah blah, the same logic would apply to say to DH, where privateers would have to wait a season or two for the trickle down. People complain about the UCI, but it seems like a free for all on the technology front for MTB. Feb. 25, 2014, 8:39 a.m.
Feb. 25, 2014, 8:48 a.m. I'd happily ditch all three sizes for 28". the 26 x 1 3/8" (650a) would have made more sense to adopt than 650b, as it's exactly between 26 [HTML_REMOVED] 29 in diameter. curious of the reasoning behind picking 650b in the first place. Feb. 25, 2014, 9:08 a.m.
do 650b riders have an unfair advantage in dh? how many wc races have been won on 650b? Feb. 25, 2014, 9:48 a.m. I don't think the uci cares that much about dh to bother contemplating such things. 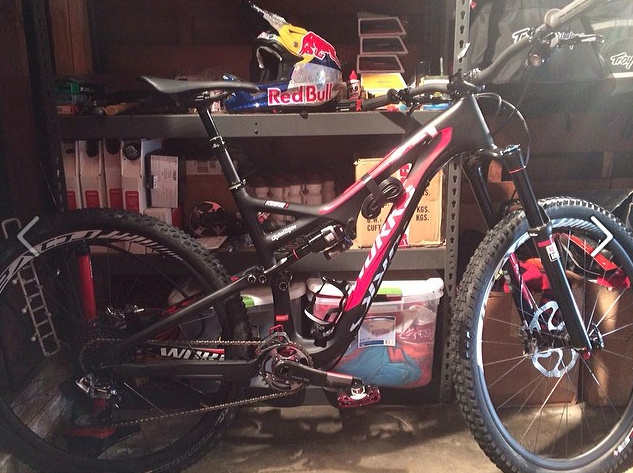 that said, a few more companies are rolling out proto 650 wc rigs now (devinci, trek, lapierre, commencal…). riders seem to be warming up to them (whether by personal preference or company mandate who knows), so we'll most likely see them taking over the podiums in short order. Feb. 25, 2014, 9:55 a.m.
Feb. 25, 2014, 10:35 a.m.
curious of the reasoning behind picking 650b in the first place. I think the reason was that rims were available in that size when Pacenti built the first mtn bike. Feb. 25, 2014, 10:59 a.m.
ah. I assume the 650b rims used for touring bike applications at the time were better than the 26x1 3/8" department store iterations (mostly crappy steel). Feb. 25, 2014, 11:33 a.m.
Feb. 25, 2014, 11:37 a.m. Pretty sure someone said the same thing when the first Rock Shox failed to win an XC World Cup. Feb. 25, 2014, 11:46 a.m.
Feb. 25, 2014, 3:28 p.m.
Im going to say none, but I believe Loic Bruni came 2nd to Steve Smith at the season finale race on a 650b rig. But we know performance is all in the bike and the rider is just a meat puppet in there for the ride. Feb. 25, 2014, 4:01 p.m.
March 20, 2014, 8:15 a.m.